Truffle Hunter and Spanks represent Ballymore Stables on Thursday at Bendigo. Truffle Hunter (pictured) is in the second race, the 3YO Maiden over 1600m where he will be ridden by Patrick Moloney and has drawn barrier 11. The son of Delago Deluxe finished sixth on debut over 1400m at Wangaratta at the end of last month and Mike Moroney is happy with the way he has come on from the run. “He’s come on in his fitness levels since that first run and we’re really happy with him,” Moroney said. Truffle Hunter led early at his first start and Moroney said similar tactics will be employed once again. “He’s drawn out but we’ll roll forward again and try and put him on speed,” Moroney said. “We’re not sure if he has a turn of foot at this stage so we’ll try and put him in the race and give him his chance. 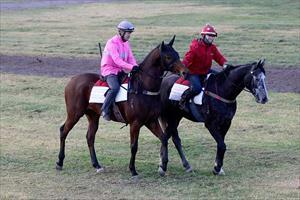 "We've finally drawn a barrier with her which means she can race handy without having to be used up," Moroney said. "It looks an even race and our filly is as fit as she can be with several things in her favour like the weight, distance and draw. "The Darren Weir-trained filly looks the one to beat but we feel Spanks can be competitive."